<> on November 9, 2018 in Washington, DC. 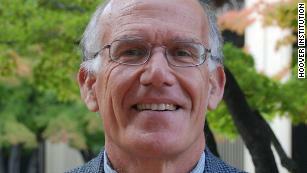 Victor Davis Hanson is a senior fellow at the Hoover Institution, Stanford University, and the author of the just released “The Case for Trump” (Basic Books) The views expressed in this commentary are his own. View more opinion articles at CNN. (CNN) Progressives wonder how in the world could anyone still support President Donald Trump. So here are ten reasons why more than 40% of the electorate probably does — and will. 1. Voters appreciate that the economy is currently experiencing near record-low peacetime unemployment, record-low minority unemployment, and virtual 3% annualized GDP growth. Interest andinflation rates remain low. Workers’ wages increasedafter years of stagnation. The US is now the world’s largest producer of oil and natural gas. And gasoline prices remain affordable. The President continues to redress asymmetrical trade with China, as well as with former NAFTA partners and Europe. He jawbones companies to curb offshoring and outsourcing. The current economic recovery and low consumer prices have uplifted millions of middle-class Americans who appreciate the upswing. 3.Trump can be uncouth and crass. But he has shown an empathy for the hollowed-out interior, lacking from prior Republican and Democratic candidates. His populist agenda explains why millions of once traditional Democratic voters defected in 2016 to him — and may well again in 2020. Some polls counterintuitively suggest that Trump may well win more minority voters than prior Republican presidential candidates. 4. Trump may come across as callous to some, but to others at least genuine. He does not modulate his accent to fit regional crowds, as did Barack Obama,Hillary Clinton and Joe Biden. He does not adopt particular outfits at state fairs or visit bowling allies to seek authenticity. Like him or not, his Queens accent, formal attire, odd tan, and wild hair remain the same wherever he goes and speaks. Voters respect that he is at least unadulterated in a way untrue of most politicians. Big Macs convey earthiness in a way arugula does not. 5. Even when Trump has hit an impasse, his supporters mostly continue to believe that he at least keeps trying to meet his promises on taxes, the economy, energy, foreign policy, strict-constructionist judges, and the border. So far his supporters feel Trump has not suffered a “Read my lips” or “You can keep your doctor” moment. 6. Voters are angry over the sustained effort to remove or delegitimize a sitting president. Many of the controversies over Trump result from the inability of Hillary Clinton supporters to accept his shocking victory. Instead they try any means possible to abort his presidency in a way not seen in recent history. Trump voters cringe at such serial but so far unsuccessful efforts to delegitimize the President: the immediate law suits challenging voting machines, the effort to warp the Electoral College voting, initial impeachment efforts, appeals to the Emoluments Clause, the 25th Amendment, and the calcified Logan Act, the Mueller investigation that far exceeded and yet may have not met its original mandate to find Russian “collusion,” and the strange Andrew McCabe-Ron Rosenstein failed palace coup. All this comes in addition to a disturbing assassination “chic,” as Madonna, Johnny Depp, Kathy Griffin, Robert DeNiro and dozens of others express openly thoughts of killing, blowing up, or beating up an elected president. The Shorenstein Center at Harvard University has found that mainstream media coverage of Trump’s first 100 days in office ranged from 70-90% negative of Trump, depending on the week, an asymmetry never quite seen before seen but one that erodes confidence in the media. Voters are developing a grudging respect for the 72-year-old, less-than-fit Trump who each day weathers unprecedented vitriol and yet does not give up, in the Nietzschean sense of whatever does not kill him, seems to make him stronger. 7. Progressives seemingly do not appreciate historical contexts. By past presidential standards, Trump’s behavior while in the White House has not been characterized by the personal indiscretions of a John F. Kennedy or Bill Clinton. His language has been blunt, but then so was Harry Truman’s. He can be gross, but perhaps not so much as was Lyndon Johnson. The point is not to use such comparisons to excuse Trump’s rough speech and tweets, but to remind that the present media climate and the electronic age of the Internet and social media, along with general historical ignorance about prior presidencies, have warped objective analysis of Trump, the first president without either prior political office or military service. 8. Globalization enriched the two coasts, while America’s interior was hollowed out. Anywhere abroad muscular labor could be duplicated at cheaper rates, it often was — especially in heavy industry and manufacturing. Trump alone sensed that and appealed to constituencies that heretofore had been libeled by presidents and presidential candidates as “crazies,” “clingers,” “deplorables” and “irredeemables.” Fairly or not, half the country feels that elites, a deep state, or just “they” (call them whatever you will) are both condemnatory and yet ignorant of so-called fly-over country. Trump is seen as their payback. 9. For a thrice-married former raconteur, the Trump first family appears remarkably stable, and loyal. The first lady is winsome and gracious. Despite the negative publicity, daughter Ivanka remains poised and conciliatory. The appearance of stability suggests that if Trump may have often been a poor husband, he was nonetheless a good father. 10. Trump is a masterful impromptu speaker. Increasingly he can be self-deprecatory, and his performances are improving. Even his marathon rallies stay entertaining to about half the country. He handles crowds in the fashion of JFK, Bill Clinton, or Barack Obama rather than of a flat Bob Dole, Hillary Clinton or Mitt Romney.